Ground turkey has replaced ground beef in a variety of dishes I make, from meatballs to tacos because it is, or at least can be leaner than most ground beef offerings. But I’ve warned you before that not all ground turkey is all that lean, read the nutrition label to find the leanest variety your food store offers. Which is leaner? Do you see the different descriptions? No? Another reason to always read nutrition labels. Some brands offer lean and extra lean ground turkey. I recently found another variation of that in the Honeysuckle brand, made by food giant Cargill. 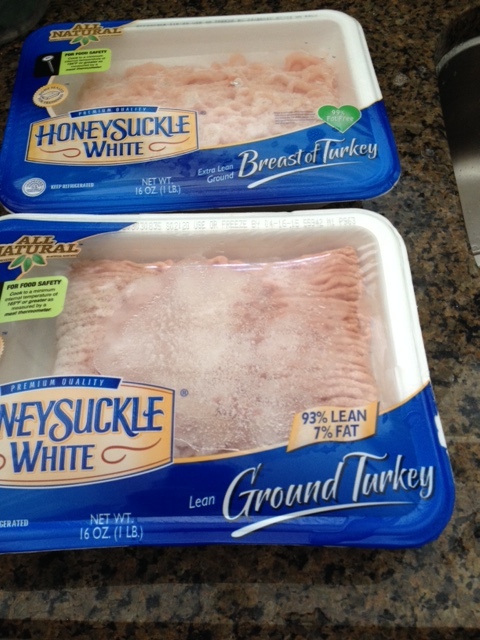 It offers white meat ground turkey and breast meat ground turkey. You would think white meat would be the leanest, but the breast meat offering is leaner, 1.5 grams of fat per four ounces compared with 8 grams in the other variety. Why? I’m guessing skin is ground along with the meat for the higher fat one, it adds flavor and moisture. When you find these two types, buy one of each package to mix in a turkey meatloaf to get some flavor and lower fat content overall.